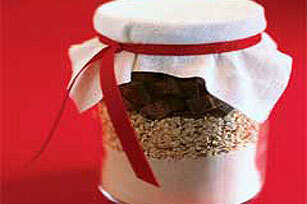 Whip up a jar of this Mix for Oatmeal Cookies as a thoughtful gift. The recipient adds butter, egg & vanilla for easy chocolate chunk and oatmeal cookies. Layer all Cookie Mix ingredients in glass jar; cover with lid. Store at room temperature until ready to use to prepare cookies or give as a gift. Heat oven to 375°F. Beat butter, egg and vanilla in large bowl with mixer until well blended. Add Cookie Mix; beat or stir until well blended. Drop heaping tablespoonfuls of dough, 2 inches apart, onto baking sheets. Bake 12 to 13 min. or until golden brown. Cool on baking sheets 1 min. ; remove to wire racks. Cool completely. Enjoy your favorite foods on occasion and remember to keep tabs on portions. Be sure to include a tag with the jar of Cookie Mix listing both the additional ingredients needed and the mixing and baking directions. Add a layer of 1/2 cup chopped PLANTERS Pecans, raisins or dried cranberries to the Cookie Mix.